1813 S Saunders Street, Raleigh, NC, U.S.A. This property is situated within a 3-minute drive of Interstate 40, south of the Raleigh city centre. This value hotel is well suited for budget-conscious travellers looking for convenient highway access. This hotel is smoke free and all rooms include free Wi-Fi, a flat screen TV, a safe and air conditioning. Select rooms also include a mini-fridge, a coffeemaker and a microwave. Suites, accessible rooms and accessible entrances are also available. Free parking is available on site and pets are permitted in select rooms at no additional fee (limited to one pet per room). A free breakfast is served daily from 6 am to 9:30 am. This hotel does not have an on-site restaurant. Other on-site amenities include free coffee in the lobby and a snack centre. There are no on-site recreational facilities. The Red Hat Amphitheater is a 2-minute drive away, while North Carolina State University is 8 minutes away by car. St. Augustine's College is a 9-minute drive away, while the Raleigh City Auditorium is 10 minutes away by car. Downtown Raleigh is about 5 to 10 minutes away by car and features the North Carolina State Capitol. The Time Warner Cable Music Pavilion is 15 minutes away by car. Many guests described their rooms as clean and well appointed, while some other reviewers found the rooms spacious and the beds comfortable. A few guests appreciated that the hotel was smoke free, while a few other reviewers liked that the rooms were furnished with wood floors instead of carpeting. 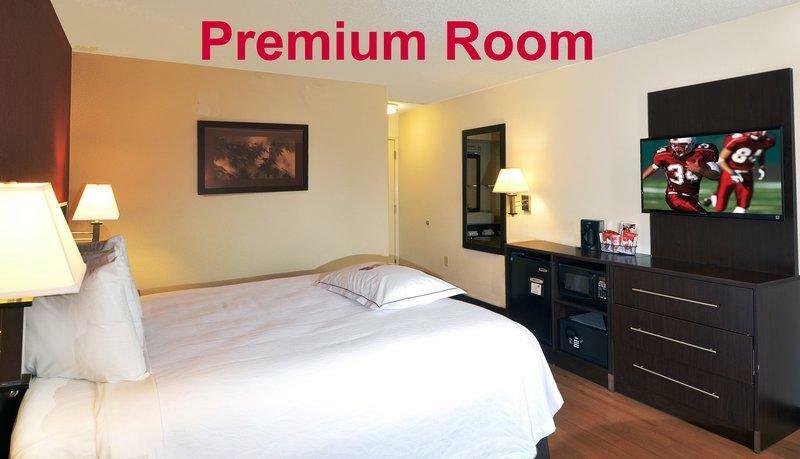 Many guests found the hotel conveniently located for accessing the highway, the downtown area and NCSU. A couple of reviewers were happy that this hotel allowed pets to stay for free. While many guests described overall positive experiences at this hotel, among the reviews sourced for this analysis, there was one uncommon but reoccurring concern: a couple of guests noticed unpleasant smells in their rooms. Expedia.ca gave this hotel an average score of 4 out of 5, with 89% of 346 guests recommending the property. TripAdvisor.ca ranked this hotel #18 out of 80 hotels in Raleigh, with an average score of 4 out of 5, from 86 reviews. Rating: #33 out of 89 hotels in Raleigh ranked by guests. "Well, it was inexpensive....Can't say much more than that.....Front desk staff was on the border with rude at check-in. We went the next day to an even cheaper Motel in a nearby city and had a larger room, with more amenities in the room, plus a pool for less."